We’re not even to the halfway point of calendar summer and I’m already starting to miss it. Nowadays public schools start ridiculously early and the place where I teach will be starting its fall semester before long. All of these things contribute to the feeling that summer is almost over. At least there is the salve of the impending start of college football season. What really triggers my late-summer doldrums is the prospect of another local peach season coming to an end. On my most recent trip to Jimmie’s Peach Stand in Chilton County, one of the Harrison sons predicted that their peach trees would only be yielding for another ten days to two weeks this year. The drive to Chilton County and along back country roads to Jimmie’s is always a tonic for me and I hate to see it end each year around this time. I have written about Jimmie’s in the past and about my regular trips during their season which usually commences around Mother’s Day and ends in late-July and occasionally into August. I try to get down every two weeks during the season and I try to only eat Chilton County peaches purchased at Jimmie’s. In a conversation a few years ago, I asked Jimmie Harrison for recommendations of good peaches in north Alabama. “I always thought Mr. Isom grew a good peach,” he said, referring to Isom’s peach orchards near Athens. So when the Jimmie’s crop is depleted, I can usually rely on Isom’s for another basket or two (www.isomsorchard.com). Jimmie’s peaches without any embellishment are perfect and this year’s crop seems to bear an overall larger fruit than usual. It’s impossible to have a surfeit of peaches but occasionally they get pretty ripe before I can get to them and I have some fallback recipes to make sure that not a single peach is wasted. I don’t make many pies so when I’m ready to throw peaches in the oven it’s usually in a cobbler. Over the years I have collected some ways to take full advantage of peach season and their abundance and, with the local season’s end upon us, it’s time to share a couple of fresh and simple peach recipes. The peach salsa is simple and has multiple uses. Use it however you would use any other type of salsa but I love it on a fish taco. The following recipe makes a nice batch. Simply mix all ingredients together and serve. Put half of the dark brown sugar in the bottom of a wine glass. Put peach quarters in glass. Drizzle the other half of dark brown sugar over the top of the peaches. Pour Beaujolais (or Morgon) over the peach and sugar mixture. For a really decadent variation, embellish the Beaujolais with Cointreau or Grand Marnier. Garnish with mint leaves. Both of these peach recipes capture the freshness and vibrancy of the summer season for me and enhance that distinctive peach essence in an exciting way. Make the most of the rest of your summer. Hmm … shouldn’t local figs be here soon? 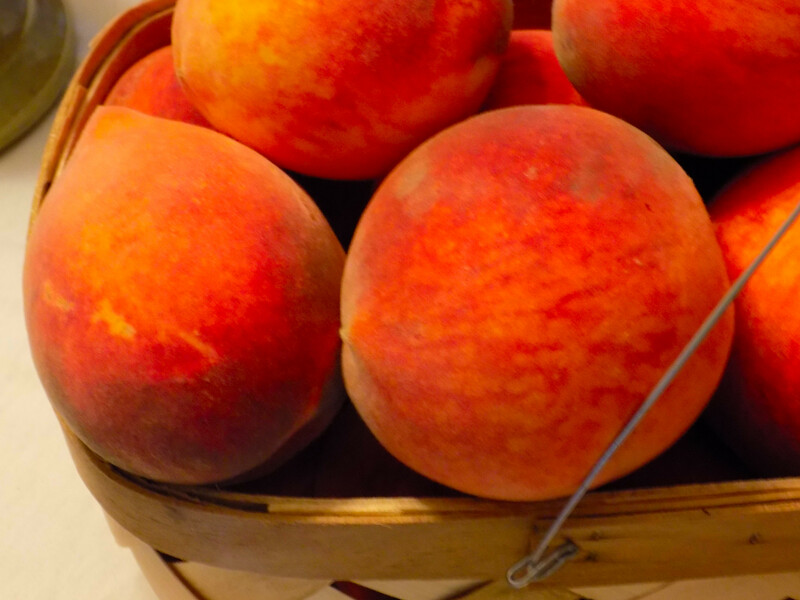 This entry was posted in Chilton County peaches and tagged Alabama, Chilton County Alabama, Chilton County peaches, Frank Stitt's Southern Table, Isom's Peaches, Jimmie Harrison, Jimmie's Peach Stand, peach salsa recipe, Peaches and Beaujolais recipe on July 30, 2016 by gedwardjourney.